Neither liberals nor conservatives are chomping at the bit to discuss the historical roots of the modern gun-rights movement. If asked to describe it, liberals will gesture vaguely at the ’80s and ’90s, blaming survivalists, school shootings, “cold, dead hands” and the National Rifle Association. Conservatives, on the other hand, will jump the historical mark by some distance, talking about the founding fathers, the Second Amendment and the right to an armed militia. Neither side wants to admit that the first modern anti-carry law was passed by California Governor Ronald Reagan in 1967. Nor would they want to mention that Reagan passed the law to disarm the twentieth century’s greatest gun-rights militia: the Black Panther Party. Political genealogies in America are more mixed than the 24/7 news cycle will allow. In her first book, The First Civil Right: How Liberals Built Prison in America, historian Naomi Murakawa demonstrates how the American prison state emerged not out of race-baiting states’-rights advocates nor tough-on-crime drug warriors but rather from federal legislation written by liberals working to guarantee racial equality under the law. The prison industry, and its associated police forces, spy agencies and kangaroo courts, is perhaps the most horrific piece of a fundamentally racist and unequal American civil society. 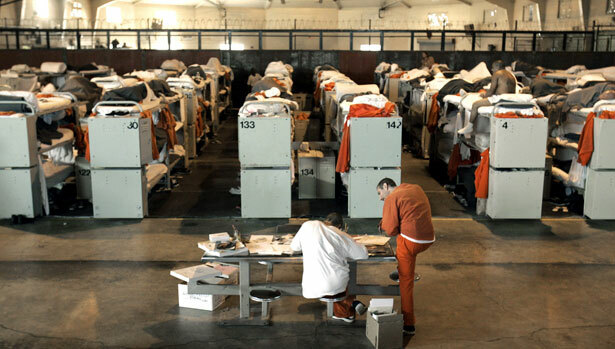 More people are under correctional supervision in the United States than were in the Gulag archipelago at the height of the Great Terror; there are more black men in prison, jail, or parole than were enslaved in 1850. How did this happen? The common-sense answer is that launching the war on drugs during the backlash against civil-rights struggles encouraged agents of the criminal-justice system to lock up black people for minor infractions. This isn’t wrong, or not exactly. Ronald Reagan’s infamous Sentencing Reform Act of 1984, which established federal minimums (a k a sentencing “guidelines”) and abolished parole in the federal prison systems, did lead to an explosion in the number of federal prisoners, particularly drug offenders. It was one of the pivotal moments in the production of the prison-industrial complex (PIC)—the overlapping sphere of government and industrial activity that employs hundreds of thousands of guards, cops, judges, lawyers, bail-bondsmen, administrators and service employees and which sees millions of prisoners performing barely paid production labor to generate profit. But, as Murakawa painstakingly demonstrates, the Sentencing Reform Act has a “liberal core,” and is built on the technical and administrative logic of racial fairness that structures all federal civil-rights legislation. This is the fundamental thesis of Murakawa’s book: legal civil rights and the American carceral state are built on the same conceptions of race, the state and their relationship. As liberals believe that racism is first and foremost a question of individual bias, they imagine racism can be overcome by removing the discretion of (potentially racist) individuals within government through a set of well-crafted laws and rules. If obviously discriminatory laws can be struck down, and judges, statesmen or administrators aren’t allowed to give reign to their racism, then the system should achieve racially just outcomes. But even putting aside the fact that a removal of individual discretion is impossible, such a conception of “fairness” applies just as easily to producing sentencing minimums as school desegregation. Murakawa’s method is to apply deconstruction to the congressional record, reading government documents in search of their guiding political and ideological assumptions. “Implicitly,” she argues, “this perspective discounts intentions, recognizing that racial power is not necessarily exerted by will.” Why wade through rancorous debate between liberals and conservatives if all the hubbub resulted in a massively bipartisan project of racist imprisonment? Race-liberalism, on the other hand, remains the dominant—and usually unspoken—American framework for understanding race. Built on the premise that racism is real but manifests as the prejudice of white people, race-liberals argue that individuals’ racism can corrupt institutions and bias them against black people. That bias damages black psyches as well as black people’s economic and social prospects. Race-liberals believe that training, laws, stricter rules and oversight can eliminate prejudice and render institutions “colorblind.” Since it is biased treatment that damages black prospects, then this fix—civil rights—applied to all of society’s institutions, would eventually end racial disparity. Both race-liberals and race-conservatives base their theories on one disastrous assumption: black people naturally produce crime. For race-conservatives, black people are innately, genetically criminal, full stop. For race-liberals, the psychological, economic and social damage of prejudice makes black people “lash out” violently and criminally–either in the form of individual criminal acts or, as the black freedom movement begins in earnest, as protests and rioting. Under both schema, however, the reason society must achieve racial equality is because equality will eliminate black crime. Race policy and civil rights, according to Murakawa, thus became a lever for dealing with black criminality: Southern race-conservatives, pointing to the lack of race riots in the South, argued that civil rights actually increased black crime, because they made black people freer to follow their true criminal desires. The arguments race-liberals marshaled for civil rights were no more based in an ethics of equality: increased racial justice, politicians argued, would mean decreased psychological, economic and social damage to black people, and thus decreased black crime and unrest for the people who mattered. In the immediate aftermath of World War II, lynching became an international scandal and disgrace, recognized as such by Europeans with an intimate knowledge of fascism. Northern liberals, who had begun to consolidate black votes through the New Deal, saw racial terrorism as a vital electoral issue. Truman thus went about attacking lynching, but framed it as a crime issue, treating each lynching as its own arbitrary and singular act of racial prejudice. And as white race riots and lynchings were often committed under the protection of police and Southern Democrats, federal courts, federal oversight and federal police funding and training became a way to rein in local racist influence and protect black people from extra-legal violence. Thus we encounter the titular first civil right: the right to safety from extralegal (white) violence. Liberal law-and-order translated international battles against colonialism and genocidal racial violence into an agenda of procedural fairness, race-neutral machinery, and formal equality. Race liberals…set out to corrrect the lawlessness, not the lethality, of racial violence. In this sense, the fight for racially just law-and-order was already lost. In other words, black people were guaranteed safety only from violence falling outside of a fair set of legal rules. A report from Truman’s Presidential Committee on Civil Rights holds that “[a society] cannot permit human beings to be imprisoned or killed in the absence of due process of law without degrading its entire fabric.” (Emphasis mine.) Society can imprison and kill, as long as the law was followed fairly. For race-liberals this is not a contradiction: if racism is a case-by-case fairness problem, if white supremacy is an arbitrary unfairness, then a perfect and fair set of legal rules is mutually exclusive with racism. Therefore, perfectly administered rules ipso facto stop racial discrimination. Some saw police funding as a way to repress rioting and law-breaking; others saw police funding as a way to suppress impetuses for rioting by improving “police-community” relations…. Different groups supported change, believing it would promote different interests. I would say here that they have the exact same interest: counter-revolution. They want to stop the riots, and return to law and order. By ignoring intentions, Murakawa’s account can observe precisely how certain bipartisan outcomes are achieved, but the method also sometimes misses the way liberals and conservatives collude due to a shared class interest in stability. Prison rates may have skyrocketed faster in the United States than anywhere else, but prison populations worldwide have grown tremendously during the same period. Prisons are one way to address the ongoing global crisis of falling rates of profit that began in the early ’70s. Massive prison populations lower unemployment in the short term and discipline the work force by transforming working-class people into felons who can be relegated to low-wage jobs. High incarceration rates also move first-world manufacturing from union shops into prison yards where pay can be 25 cents an hour without having to fear the social consequences. In one sense, The First Civil Right lets liberal politicians off the hook by not going after the interest groups and industries that they actually represent. A study more inclined to follow the money might reveal them to have gained equally from the production of the PIC, and to have been serving their real class constituency just as ably as the conservatives in doing so. All of this is not to argue that big money is more important than racism. Every single dollar bill is soaked with the blood of slaves: there is no economy without white supremacy, and vice versa. Murakawa’s important work resolves a nagging question: how, exactly, the American historicizing of the black freedom movement and the production of civil rights has structured our conceptions of race, justice and crime. It’s one of the most maddening contradictions of American history: there is no New Jim Crow without Brown v. Board of Education. Willie OsterweilWillie Osterweil is a writer and editor at The New Inquiry.